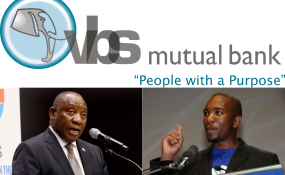 EFF Deputy President Floyd Shivambu has denied receving R10m from embattled VBS Mutual Bank in his first direct response to the allegations against him and his brother Brian. "For the record, I have never received R10 million from VBS or anyone in my personal account," said a statement sent by Economic Freedom Fighters' spokesperson Mbuyiseni Ndlozi on Shivambu's behalf on Saturday. "Faceless sources reportedly to be from [the] South African Reserve Bank (SARB), who have ulterior motives, have been misleading journalists and radio presenters with their malicious narrative. "I have no dealings with VBS and any attempt to link the EFF to the bank for cheap political points is a clear sign of desperation and soon enough people will see through it. The so-called well-placed sources in the SARB is a coward and a liar who misled journalists and can't even reveal their identity. "I have no dealings with VBS and attempts to link the EFF position to business dealings are disingenuous and patently weak," said Shivambu. This followed a report on Friday that the Fighters' deputy allegedly also benefited from the alleged fraudulent funnelling of money from the bank. On Friday the Mail & Guardian reported that it had seen screenshots of text messages believed to be a conversation between Floyd and a businessman that suggest a direct link between the EFF deputy president and his brother Brian Shivambu's business. In those messages, Floyd provides Brian's business account details to controversial PIC beneficiary Lawrence Mulaudzi. Mulaudzi is currently being investigated for a R300 000 request for payment to an alleged lover of PIC boss Dan Matjila. The same account number provided by Floyd, registered in the name of Grand Azania, has been allegedly linked to the suspicious VBS Mutual Bank payments.